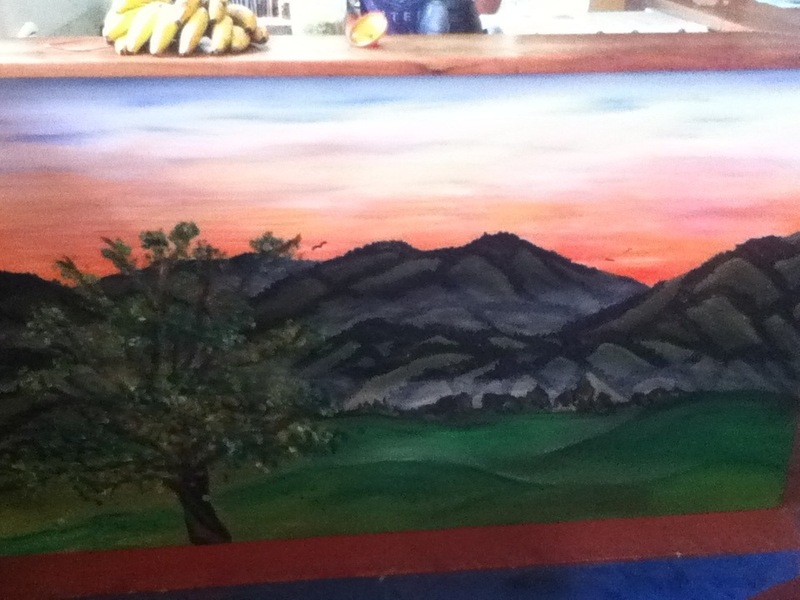 What: The mural was located in the kitchen about 35 feet long and 5 feet high. 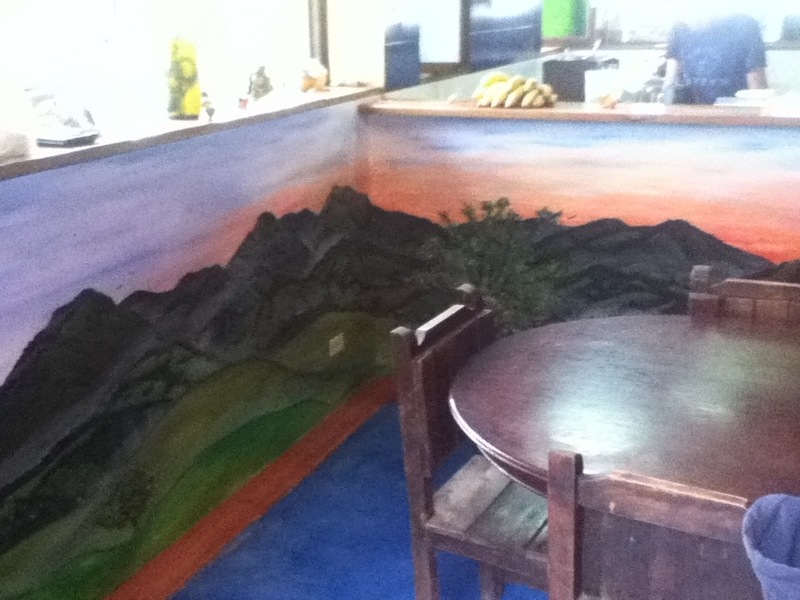 The mural wrapped around the kitchen and was split into thirds. This was the best paint that I have used on all my travels as the owner is from New York and we had the same idea of what acrylic paint was. Length of time: Three weeks painting about 5 hours a day. Accommodation: I spent the three weeks in a tent! This was my favorite accommodation yet! I also had meals at the restaurant that were amazing. While at La Serrana I chose to beome vegetarian as well! What I learned: Working in communal spaces can be exhausting. I had a lot of people cooking around me and even spilling on the mural! I would prefer a place more secluded, but it was a great experience. 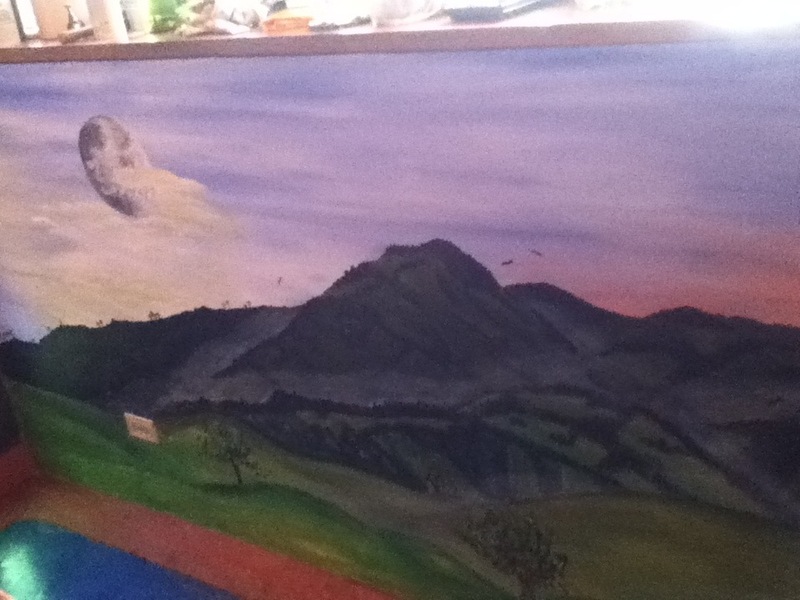 Often people would interrupt me while painting or ask if I worked at the hostel. The day has finally come, after 3 weeks in the coffee region of Colombia, I am off to a coffee tour! Truth is I was waiting for my friend from Washington State to come visit me so we could go together. Steven came with his friend Jorge and we got to go on this coffee tour together. From the center of town the tour was about 2.5 hour walk/hike down the side of a mountain to a river. Green was everywhere! There were new birds we discovered that were neon blue, yellow and red. We finally reached the house of Pedro, the owner of Salchimama where his wife and two daughters lived. It was a tiny house resembling a tree house and their beds were all tents. The house was covered in natural art from seeds and leaves. They had great knowledge on the birds in Colombia and just loved sharing their lives with us. The tour was all day, we learned about the surrounding vegetation and how that affects the animals and coffee. It’s truly amazing how welcoming Colombians are. They provided us lunch and then the later half of the day they took us to their tiny house a couple meters away on the top of a hill. It overlooked lulo fruit plants and coffee fields. The process of coffee making was surprising how simple it can be. Did you know that coffee only leaves Colombia in the form of a white bean, which actually smells like fermented vinegar? Then wherever it is exported extra ingredients are added and they charge a lot of money to sell it with additives. The beans are found in bushes that are red and not native to Colombia. They were imported from Africa and Vietnam. Colombia has a great climate to grow the beans, making it the third latest county exportin coffee behind Vietnam and Brazil. The tour was $20,000 COP ($10.00 USD) and was worth every penny. However to take back the jeep instead of walking the two hours its a whopping $70,000 COP ($35.00 USD). My second time to Corcoa Valley where the wax palms and fog live. Sure enough, some yoga poses and a couple minutes later the clouds part and just a speck of the sunshine hits the valley. The most picture perfect lighting on the lime green hills. The sun behind the clouds made for the perfect sunset. We watched for the next two hours and sat in silence taking in every inch of energy that the mountains gave us. It was absolutely stunning. Five of us decided to go on the adventure to see the sunset. We heard it’s a good show. I have done the full 5/6 hour hike but this time we decided to do the tail end, the best part, and watch the sun go down in the valley. Typically this area is covered in fog, so we were hoping for the best around 615pm. 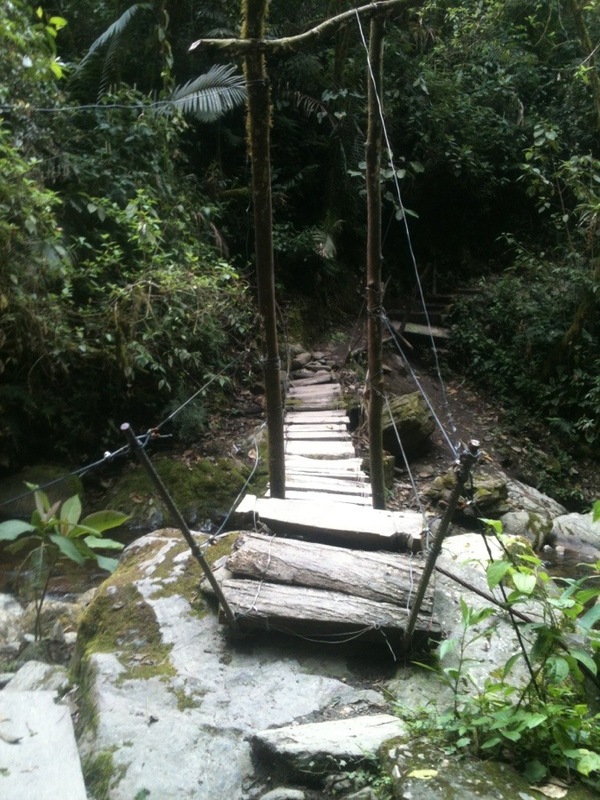 Corcora Valley is a $3,200 COP, $1.60 USD to take a jeep into the Valley. You get off at a small bus stop and start the hike. The path to the right leads to the hummingbird farm and the waterfall, about a 5/6 hour hike. It’s a loop that goes along a river and then into the mountain. It ends in the valley where the palms, horses and cows are. We decided to go left, to catch the end of the hike and it’s just about an hour where you have to dodge horses and people descending the hike. We arrived at the lookout point, a little nook of green grass at the top of the mountain overlooking at 360 view of the valley, and we were an hour ahead of schedule. The fog completely filled the valley. “Darn it! Maybe it will clear up” we thought. As we descended we got lucky and caught a jeep back for the same price $3,200 COP, $1.60 USD. They usually stop at 5pm and we caught one magically at 730pm. Great timing right, a family was getting done with work and we caught a ride with them. I have to make this hike again before I leave. I heard there is also a 3 to 4 day hike into the same valley that is supposed to be worth doing. Falling in love with Salento more and more each day. At the end of the journey the jeep dropped us off in town, and we drank delicious Colombian coffee from the land at Jesus Martin, a highly recommended coffee shop in the central downtown. The cappuccinos are to die for, and the artwork to top doesn’t hurt as well! Magical mountains, birds singing a symphony of songs, delicate raging rivers, potent flowers shining in the sun and shades of varadescent greens cover the rolling hills in this story book land. Salento, Colombia is one of the most beautiful places I have seen on my journey thus far. I forgot how beautiful the mountains are. In Salento there is the most gorgeous hike that I’ve ever been on. It’s called Valley de Cocora and it’s about 45 minutes $3,500 COP ($1.70 USD) out of Salento. It’s free to do and about 6-7 hours to do the whole loop. There is even a hummingbird farm! This hike was stunning: tiny path lined with wax palms, mysterious clouds thickly wet with dew, the occasional cow, waterfall after waterfall, and rolling hill after rolling hill. There was one mountain that was later than the others, and the clouds would creep slowly up it, and then spiral down the side. I’ve never seen anything like it, I felt as I had fallen asleep in a fairy tale and awoken to a new world. After traveling almost 3 months on the coast I forgot how wonderful the mountains are. Going from 90 degree heat to rain and lucious trees has made me appreciate the qualities of both landscapes. Colombia is so diverse and colorful, every place is so distinctly different. To get to Salento from Manizales you can go to Pereira or Armenia. Both are easy and both will get you to salento. I chose to go through Peridea. It was $8,000 COP ($4.00 USD). It was about 1 hour bus ride. From that terminal I got another bus to Salento. It was just a 45 minute bus ride for $8,000 COP ($4.00 USD). It’s a short ride and easy to catch from Peridea. The weekend schedule is different from the weekday schedule so make sure you check before you go.